Adopt ordinances, resolutions, policies and regulations for the health, safety, and welfare of the residents of Semmes. Establish policies for the effective and efficient delivery of municipal services to the City. Establish goals, objectives, and performance measures for the City Government. Add, delete, modify, or reduce municipal services and staff due to budget restrictions. Create departments, divisions, offices, and citizen advisory committees necessary for the efficient and effective operation of the City. Exercise oversight over the professional staff, consultants, citizen advisory committees, and all other employees, volunteers, and officers appointed or retained by the City. Work with citizen advisory committees established by the City Council to formulate recommendations to the City Council on policies, projects, and spending allocations. Every member of the governing body is expected to take committee assignments and attend all committee meetings. Participate in community strategic and long-range planning. Adopt master plans for water, wastewater, storm drainage, parks, and municipal facilities to guide the City’s future development of infrastructures. Approve the municipal boundaries, and all annexations of land into the City. Approve all subdivisions, commercial, and industrial site plans. Approve all development plans and agreements with residential, commercial, and industrial developers. Adopt a five-year Capital Improvement Plan. Adopt the annual City budget. Approve expenditure of City funds. Promote good relations with federal, state, and other municipal government agencies. 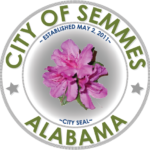 The Mayor and City Council will actively work with appropriate officials on inter-jurisdictional issues and regional problems affecting the residents of Semmes. Perform other duties as necessary and as established by ordinance, resolution, contract or regulation.